37 in 1 sensor modules kit is the most complete sensor module kit for Arduino beginner. It is easy to use and storage with plastic box. Using only the components provided, you can with no prior experience to start building complex electronics projects. Our products inside the plastic boxes more regularized, more protective. 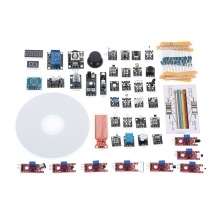 This kit is the advanced kit, including 37 sensor modules for you to do different experiments and add more fun.